A new lawsuit centered on the behavior of California’s Viejas Casino & Resort centers on the unfair-to-consumers practices employed by many of the US’s tribal casinos under the protective guise of sovereign immunity, which makes it all but impossible for aggrieved consumers to pursue their claims. But this new case comes with an added twist: Instead of naming the Viejas casino itself as a defendant, it instead names several of the casino’s employees who were involved in the alleged fraudulent scheme. The case involves a “Dream Machine” promotion run by the Viejas casino in May of 2016, in which casino customers earned entries into a drawing for a 2016 Aston Martin Vantage GT, worth about $134,000. The winner of the drawing, Merida Manipoun (also legally known earlier as Anoma Sengvixay) was present for the drawing, called up onto the stage at the Viejas casino, and announced at the winner, She was also soon to receive a tax form including the valuation of the car — $134,000 — in accordance with state and federal laws regarding major lottery or raffle wins. After receiving her public congratulations and posing for promotional materials, Ms. Manipoun was escorted into a back room, by one or more Defendants, and subjected to a high-pressure sales pitch in which she was strenuously encouraged to forego her entitlement to the Car and, instead, accept a relatively de minimis sum of cash compensation, on the apparent theory that such would afford her appreciable tax benefits. Ms. Manipoun resisted the subject sales pitch and, instead, demanded that she be given the Car she had rightfully earned. … Thereafter, when Ms. Manipoun contacted the Aston Martin Dealership, through an in-person visit to its principal place of business, she was informed that it was not in possession of any paperwork indicating her entitlement to the Car and, to the contrary, that she would not be receiving the Car. Thereafter, on May 12, 2016, Mr. Dibela called Ms. Manipoun and informed her that despite her consistent slot machine play, her success in the Drawing, and her issuance of the Form 1099, she would not be receiving the Car or any substitute consideration of comparable value. This left Manipoun with no car and with a tax bill due on $134,000 of winnings she never received. A year and a half later, with the Viejas casino still refusing to honor the terms of its promotion, Manipoun filed suit. Last week, in an action filed by veteran gaming attorney Maurice “Mac” VerStandig, Manipoun sued three casino employers, John Doe defendants 1 through 20, and European Motorcars Ltd, which does business as Aston Martin of San Diego. Lou Dibela — one of the casino’s operations managers, and the manager on duty at the time the “Dream Machine” drawing occurred on May 7th, 2016. Linda Carr — a casino host involved in the promotion who is also involved in Viejas’ ongoing marketing to upscale gamblers such as Manipoun, a Las Vegas-area resident. The four causes of action listed in the lawsuit are fraud, conspiracy to defraud (twice), breach of unfair competition law, and breach of unilteral contract. All of the claims are made against all of the defendants, except for the breach of unilateral contract claim, which is made against only Aston Martin of San Diego. The unspoken issue, though, surrounds this question: Why does the suit name the three prominent Viejas execs but not the casino itself? That’s the tribal sovereignty issue, which has allowed such bogus marketing practices for a quarter century, all across the US. This lawsuit takes a different tack, enabled partially because drawing winner Manipoun is a Nevada resident (giving the case interstate-commerce issues), and because the value in dispute exceeds $75,000. According to the filing, that alone qualifies the matter for “diversity-based jurisdiction” and allows it, at least initially, to be filed in the US District Court for the Southern District of California. 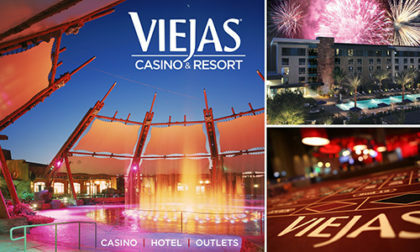 According to the theory behind the lawsuit, it also allows for the three casino employees to be sued as agents of Viejas and willing instruments of the Viejas’ casino’s fraud, even if the casino itself, sitting on tribal land, is legally untouchable in the matter. The fraudulent behavior thus transfers from the casino to its employees, who allegedly committed the fraud on the casino’s behalf but do not enjoy the casino’s sovereign-immunity protection. Unfortunately, the case is but one of a myriad of similar matters involving tribal casinos across the US, and that’s a major hurdle for the future of regulated online gambling in the US. That’s most painfully evident in the US’s most populous state, California, where a small but politically powerful group of the state’s tribal casinos have effectively blocked all online-gambling regulation for nearly a decade. The kicker: Every one of the bills that the hardline faction has allowed to move forward for committee votes or consideration has included an extension of such tribal sovereign immunity into the online sphere. Such an inclusion would, literally, allow any tribal online casino to declare that any customer’s own computer is tribal property/land for the purpose of consumer protection… pretty much eradicating that prospect. As long as the Viejas are in line for a public black eye, here’s another kicker of note for the online-gambling community. It was the Viejas tribal nation that commissioned a smear-style radio ad that ran back in 2015, in an attempt to demonize PokerStars and parent company Amaya in its attempts to lobby for regulated online poker in California. The California Legislature should be trying to stop Internet scam artists and con men. We deserve to be protected from corrupt companies like PokerStars, which was indicted by the US government for illegal gambling, bank fraud and money laundering, and paid $731 million to avoid criminal conviction. PokerStars’ parent company recently had its headquarters raided as part of an investigation into violations of securities laws, but this hasn’t stopped PokerStars from lobbying our state legislature to allow them to participate in online poker here in California, gaining access to every computer, tablet and smartphone in the state. This is not right, and we deserve better. Please go to findyourreps.legislature.ca.gov, contact your state legislator, and tell them to keep bad actors, like PokerStars, out of AB 431 and out of California. Paid for by the Viejas Band of Kumeyaay Indians. I also won a car at Viejas Casino in 2015. It was a 2016 Range Rover. I opted to take the cash, as I had just purchased a new car shortly before I was chosen in the drawing. At that time, gasoline was at an all-time high of close to $4.00 a gallon. I could barely afford to fill up my Honda Civic, much less a beast like that! My good friend also won the car drawing, not once, but 5 times, over a 3 year period. She kept 4 of the 5 cars, and she’s proudly driving her beautiful Porsche and hope she gifted her husband a gorgeous Mercedes! She kept another SUV (I can’t recall the make) as her second family car when she has her grandkids, and her youngest son got her 4th winning vehicle. Never for a moment did she, nor did I, feel ANY pressure tactics to “settle” for the cash difference. And she had no problems receiving any of her high end luxury cars! I’m not sure what this lawsuit is really about, or how much exaggeration is written between the lines. I can assure you however, if the Viejas Casino started another car giveaway, it would be a HUGE SUCCESS!!! Wait: One person won the drawing five times and it’s not rigged? Not sure if this is true but hahahahahahahahahahahahahahahahaaahhahha….. I was an employee back in 2015 and worked as a full time plumber for Viejas. A HUGE sewge leak was discovered underneath of the employee cafeteria and break areas. Multiple members of Viejas Management and H.R. decided that the cost to repair this huge health hazard( approximately $35,000. ) was too much to pay. I was instructed to “bury it and make the problem go away”. I was also told that “it is not our problem” and “by the time the sewer comes back up to the surface, we will all be old men”. I informed my manager that “per plumbing code it is against the law to bury a sewer problem of this magnitude”. I also refused to participate in the burying of the sewer pipe without proper repair. Approximately one week later I was called into H.R. and fired. Even though I had been working across the street in the outlet area that day, I was accused of creating a safery hazard back at the “broken sewer coverup project”. I was escorted off the reservation and “banned” from returning for a month. How do I get my day in court?